Training for Parliamentary Committee Appearances. In recent years, some Parliamentary Committee hearings have taken on the air of ‘public courts’. 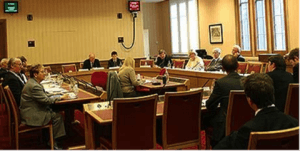 Electric Airwaves has worked at the highest levels, preparing CEOs and other senior managers to present to best effect in front of Parliamentary hearings. Core to our approach is that if you don’t want MPs to shoot the messenger, then you must sharpen the message. We roleplay the Select Committee hearing with you sitting before a panel that fires questions and dissects your answers. These are recorded and played back for analysis. We advise on the strategies, techniques and devices that will enable your spokespeople to become powerful communicators of your story, along with the dos and don’ts of appearing before the Committee. Offer tips and techniques for a powerful performance along with coaching on how to build rapport with Committee members and not antagonise them. I’m just glad it’s all over and can’t thank you … enough for the assistance in preparing for the session. I dread to think how it would have gone without the time spent … absolutely invaluable. If you ever need someone to give an overview of the benefits and importance of coaching before select committees then I most definitely the man for the job!